Welcome to Tethys! This page will help you to explore Tethys and get the most out of your experience. A sizable collection of publications – reports, journal articles, conference papers, and more – has been hand-selected for relevance to the environmental effects of wind and marine renewable energy. Over 2500 publications have been collected so far, with new items collected on a daily basis. But don’t worry about getting lost; documents are arranged in an organized table with sortable columns, a text box for keyword searches, and clickable filters to narrow down results. The filters include technology type, stressors, receptors, and more. An international collaboration under the Ocean Energy System, known as Annex IV, was formed in 2010 to examine the environmental effects of ocean energy devices. 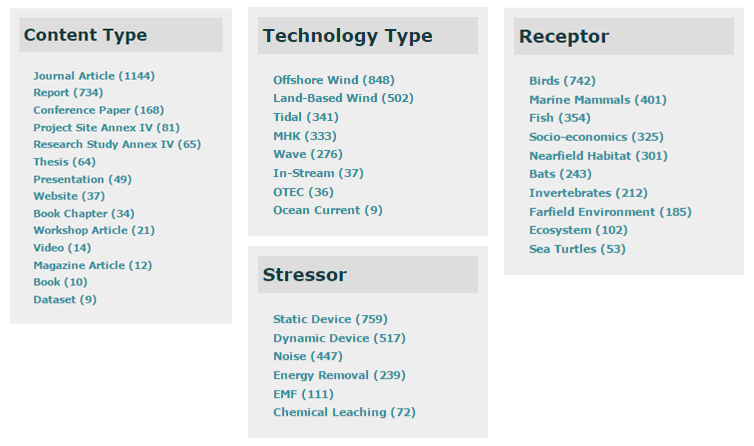 Metadata has been collected to represent up to date descriptions and outcomes of marine renewable energy projects and research studies. 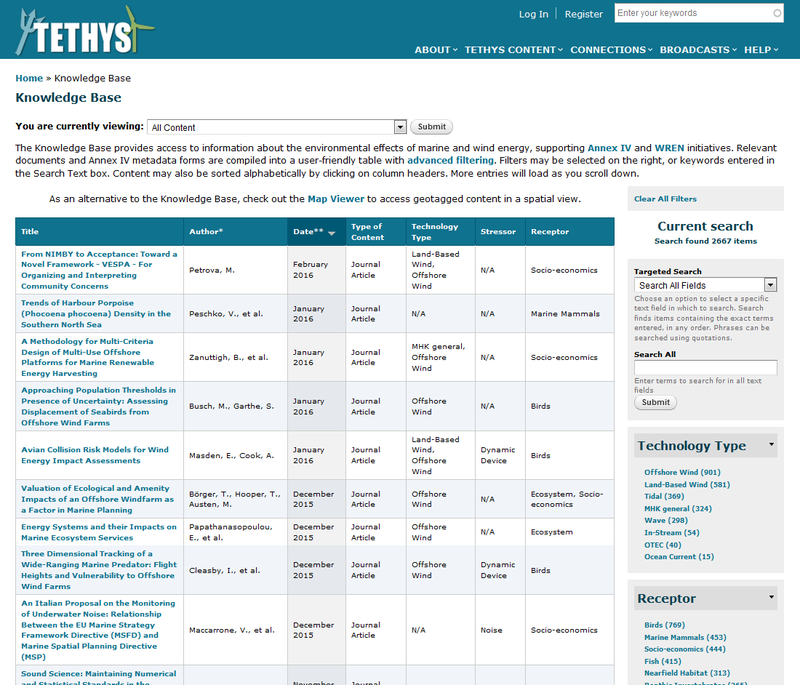 These metadata are publically available only on the Tethys knowledge base. Another international collaboration under the IEA Wind, known as WREN, has also contributed significantly to the collection of documents. 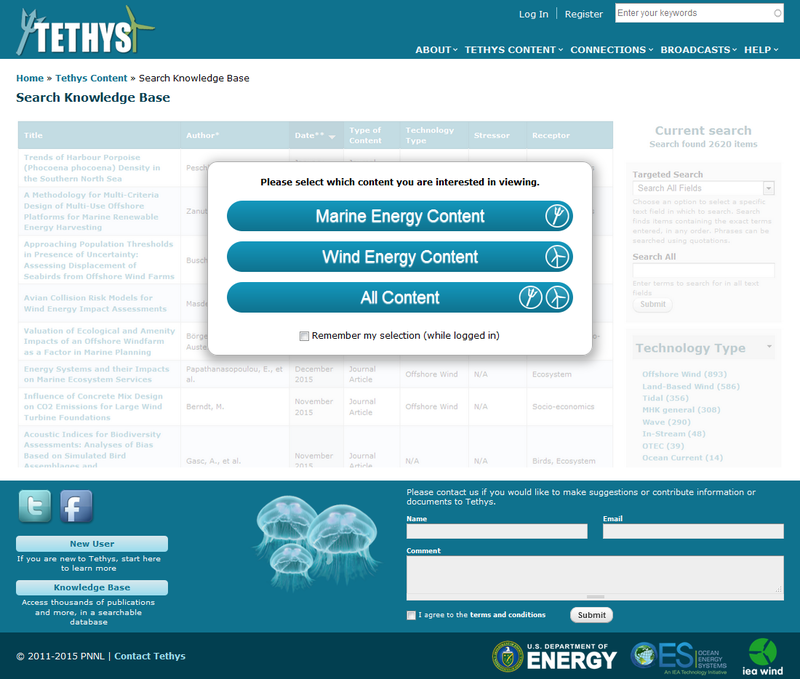 The Knowledge Base can be found from the main menu: “Tethys Content -> Search Knowledge Base”. A menu will show up that allows you to pick what content you are intersted in viewing. "All Content" has the full set of documents, while "Marine Energy Content" and "Wind Energy Content" are subsets of the total documents. After selecting a type of content, you will find yourself on a Knowledge Base page, all of which look identical. Sort columns alphabetically by clicking on the headers, clicking a second time will change the sort direction. Narrow your search with keywords. Keywords will be compared with titles, authors, abstracts, stressors, receptors, and technology types to pinpoint results. 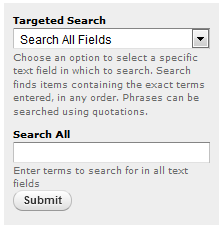 Narrow your search even further with the facet boxes on the right of the screen by clicking on the word of interest. The numbers next to the search terms will change to reflect the remaining content that matches your search. Multiple terms can be selected if you like. A subset of the full collection of publications and Annex IV metadata is also available geographically to provide a regional perspective on research and projects. A keyword search and filters are available to narrow the results displayed. Hosted on a Google maps platform, the map is familiar to navigate. Items are commonly bunched within a large blue circle to prevent clutter, but individual icons become clearer as you zoom into the map. The Map Viewer can be found under the main menu: “Tethys Content -> Search Map Viewer”. The buttons on the lower right will allow you to navigate the map by zooming (or you can zoom with the mouse wheel, and pan by clicking and dragging). The numbers in the blue circles represent how many items can be found at the general location; the circle will break apart into smaller circles as you zoom closer. Be aware that many items may share an exact location. The legend also acts as a filter, and can be accessed by clicking. There are several filters not found in the Knowledge Base that will provide you a more georeferenced look at the data. Clicking on an individual bubble or a blue cluster will open a dialogue box with information about the item georeferenced at the location, as well as a link to the publication or metadata. Rating and commenting on documents and blogs, found at the bottom of each content page. Accessing the Tethys community page, where contact information is provided for other members of the Tethys community. (Members may opt out of sharing this information). Subscribe to the Tethys Blast, our bi-weekly newsletter highlighting new information on Tethys and events of interest to the marine renewable energy community. Future additions will include links to publications. To create a User Profile, click “Register”, found in the top right corner of the Tethys Home Page. 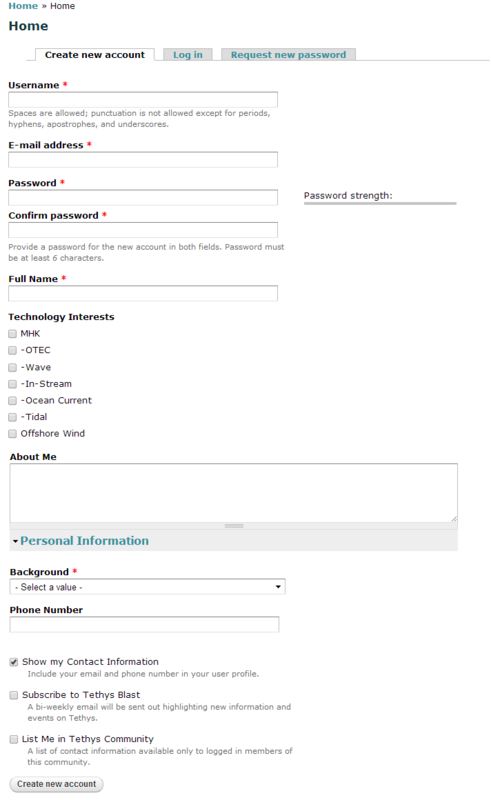 The registration form requires a username, email address, password, full name, and background (from a drop down menu). The other fields allow you to tailor your profile to inform the Tethys community of your interests and background, while the last several check boxes allow you to get involved. Unchecking “Show my Contact Information” will prevent your email and phone number from appearing on the site. “Subscribe to Tethys Blast” will sign you up to receive our newsletter every other week. “List Me in Tethys Community” will show your profile to the Tethys community if you complete the personal information section. Organizations - As relevant documents are added to Tethys, we tag author affiliations and sponsoring organizations associated with each publication. Basic information, including a description, logo, website, and geographic location is available for each of these 1000+ organizations, along with a list of all publications available in Tethys related to the organization. Database Connections - A list of databases that are complementary to Tethys has been compiled in order to encourage collaboration among practitioners. If you can’t find what you are looking for on Tethys, check out these similar databases. Regulatory - There are currently 23 member nations with interests in marine renewable energy who participate in the International Energy Agency’s Ocean Energy Systems collaboration. This page compiles basic regulatory information for permitting (consenting) a project in each of these countries, providing links to the key regulating agencies and links for more detailed information. Regulatory information for each country can also be easily compared for an interesting perspective on global marine renewable energy development. Tethys Community - Only those logged in to a Tethys user account will be able to access this page. This list compiles contact information and interests for all Tethys members who opted to join the page, including researchers, regulators, consultants, developers, stakeholders, and students from many countries. This list is constantly growing as more people become involved with Tethys, and will provide opportunities for members of the Tethys community to interact. Environmental Webinars - Webinars that have been hosted by the US Department of Energy, Annex IV, WREN and other groups that pertain to the environmental effects of wind and marine renewable energy; separate mailing lists exist for marine renewable energy webinars and wind energy webinars, visit the page for more information. Conferences and Workshops - Tethys hosts results from environmental workshops and conferences that are video or audio recorded, making them available to the public. Expert Forums - Small online discussions held among invited researchers around specific technical challenges, with the results posted on Tethys for public comment and viewing. Tethys Blasts - Bi-weekly newsletter highlighting new information and events available on Tethys; you may also sign up for Tethys blasts from this page or from your user account. Tethys Stories - Stories to learn more about organizations, events, ideas, and news from the perspective of someone closely involved with the topic.